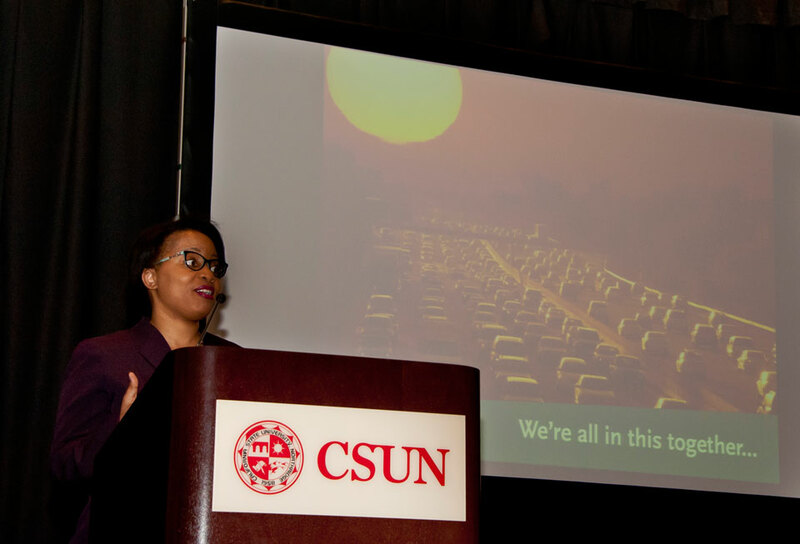 Stephanie Wiggins, Metro deputy chief executive officer, speaks about Metro transit’s proposed November ballot measure to fund major area transit projects, at a community forum on May 16, 2016 at CSUN’s University Student Union. Photo by David J. Hawkins. California State University, Northridge hosted a community forum with Metro transit officials Monday evening to explore the details of and gather input on Metro’s proposed November ballot measure to fund major area transit projects. During the May 16 program at the Northridge Center of the University Student Union, Metro officials announced that they have heard CSUN administrators’ and students’ key requests for improved service to campus — and they plan to launch expanded bus schedules that are better tailored to late-evening classes, starting next month. Wiggins and her Metro colleagues joined CSUN leaders, students, community activists, elected officials’ staff and San Fernando Valley residents to discuss Metro’s proposed plan for $120 billion in transit, highway and bike path projects over the next 40 years. If approved by the Los Angeles County Board of Supervisors for the November ballot, measure R2 would ask county voters to approve a half-percent sales tax to fund the plan. The proposed ballot measure would extend the expiring measure R, and funds would be used on transportation needs countywide. The forum was the latest in a series of transportation summits and community meetings hosted by CSUN, in partnership with elected officials, to address transit needs for the community and CSUN’s almost 50,000 students, faculty, staff and campus visitors. A CSUN student asks about future transit options between campus and the Antelope Valley, while Max Reyes, CSUN assistant director of government and community relations, holds the microphone, during a community forum on May 16, 2016 at the University Student Union. Photo by David J. Hawkins. The campus sits in the middle of a transportation desert of sorts, devoid of subway or light-rail connections and sorely lacking in the number of rapid bus lines. University officials are pushing to change this — to benefit the surrounding Valley community and bring relief to the thousands who face challenging and inefficient commutes to and from CSUN. For students such as CSUN’s thousands of Pell grant recipients, “mass transit is key to their success,” he said. Other CSUN leaders participating in Monday’s forum included Colin Donahue, vice president for administration and finance and CFO, and Francesca Vega, director of government and community relations. Wiggins noted that Metro is working on streamlining access to discounted transit passes for college students, including adding eligibility for part-time students taking as few as eight units. If approved by Metro’s board of directors, those changes would take effect in August, she said. “We want to encourage the next generation of riders,” Wiggins said. Under Metro’s massive, proposed 40-year plan, about half of the money would be used to build new major highway and transit projects such as rail lines for the Valley and improved bus rapid transit (BRT) service — and the other half would fund operations, upkeep, street improvements, service for seniors and the disabled, and more. Campus officials have proposed establishing BRT service from campus to the proposed East Valley Transit Corridor rail system, via Nordhoff Street; providing BRT service between the Orange Line and campus, along Reseda Boulevard; expanding the capacity of the CSUN Transit Center on campus; and relocating the Northridge Metrolink station slightly east to Reseda at Parthenia Street. Metro’s proposed plan will go to its board of directors for approval June 24, and then to the county Board of Supervisors. In order to get the measure on the November ballot, the supervisors must approve the plan by August, Wiggins said. Metro officials are accepting community input on the plan through Friday, May 20. For details about the proposed projects and to weigh in, visit www.metro.net/theplan or call (323) 466-3876. A complete description of CSUN’s transit priorities can be found at www.csun.edu/transitpriorities. 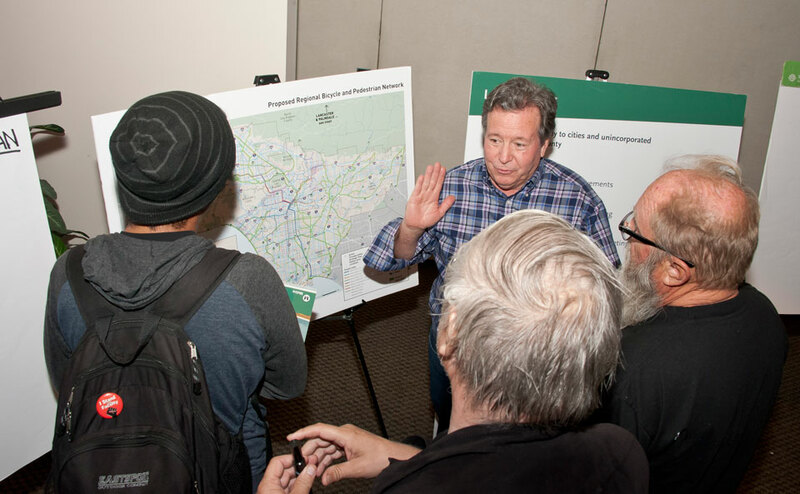 San Fernando Valley residents talk with a CSUN student about Metro transit’s proposed November ballot measure to fund major area transit projects, at a community forum on May 16, 2016 at the University Student Union. Photo by David J. Hawkins.